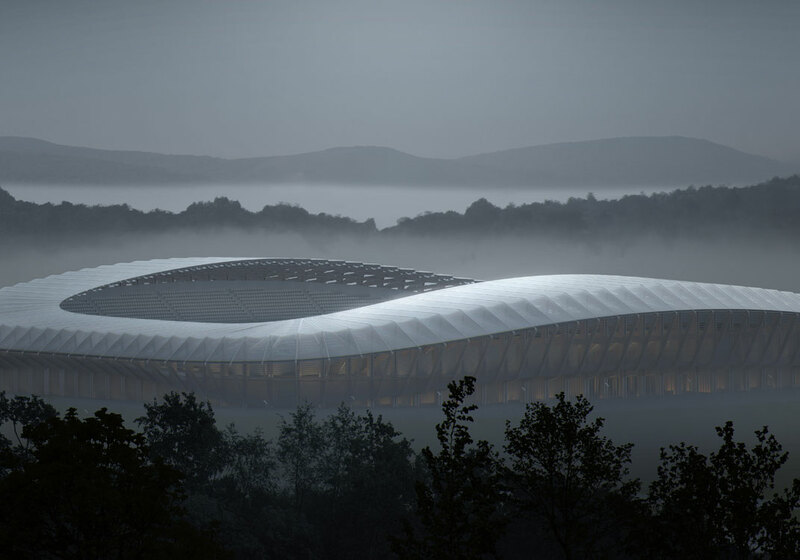 Following a seven month international competition, Forest Green Rovers has selected the winning design for its new football stadium in Stroud, UK. Rovers announced the competition in March this year, and quickly received over 50 entries from around the world, including Sweden, Germany, France, Britain and the United States. In May, the club shortlisted nine entries, and gave them all two months to work up their concepts, which were reviewed over two days in August, leading to the selection of two finalists. The final two were given another two months to take their concepts further, including a scale model. The competition is now over, and the winning design comes from Zaha Hadid Architects. 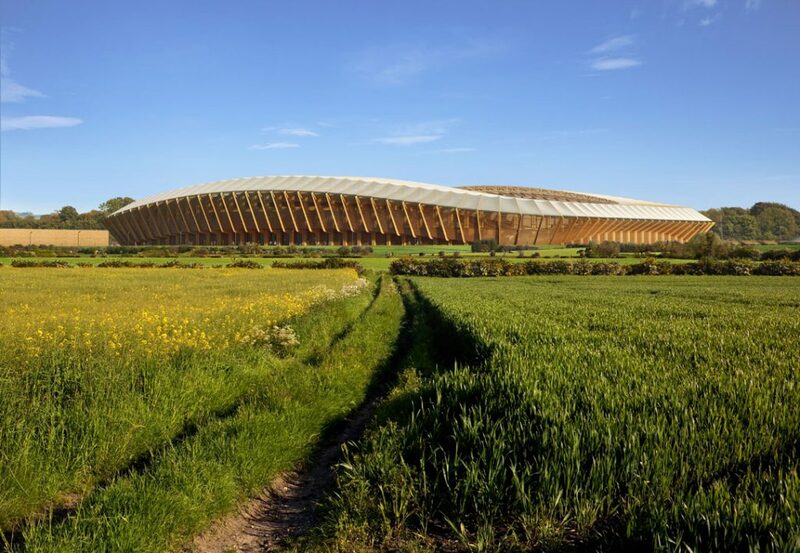 “Zaha Hadid Architects has built some fantastic sports stadia and facilities around the world, including one at the Olympic Park in London, they’ve designed one of the stadiums for the 2022 World Cup, and now they’ve designed one for Forest Green. “The really standout thing about this stadium is that it’s going to be almost entirely made of wood – the first time that will have been done anywhere in the world. “The importance of wood is not only that it’s naturally occurring, it has very low embodied carbon – about as low as it gets for a building material. “And when you bear in mind that around three quarters of the lifetime carbon impact of any stadium comes from its building materials, you can see why that’s so important – and it’s why our new stadium will have the lowest embodied carbon of any stadium in the world. “We’re thrilled with the concept and the amount of thought Zaha Hadid Architects put into their design – their experience of stadia design and their ability to put environmental issues at the heart of what they do really stood out. They took a really challenging brief, ran with it, and have given us an innovative and original new stadium. “We are very proud be selected to design the new home for Forest Green Rovers that will not only be a new stadium but also an important addition for the community. The club’s heritage, ambition and vision reflect our own, combining the latest material research and construction techniques with new design approaches to build a more ecologically sustainable and inclusive architecture. “Forest Green Rovers have established a holistic vision for the site to retain its pastoral qualities whilst adding new facilities for the town. While the stadium will be the centrepiece, the project creates a new public realm with both recreational and occupational uses, enabling the entire site to contribute to the town – not only on match days, but every day of the year. 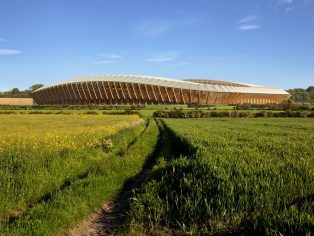 “The design retains and enhances the existing meadow landscape of the site whilst adding the stadium and other functions for the town. 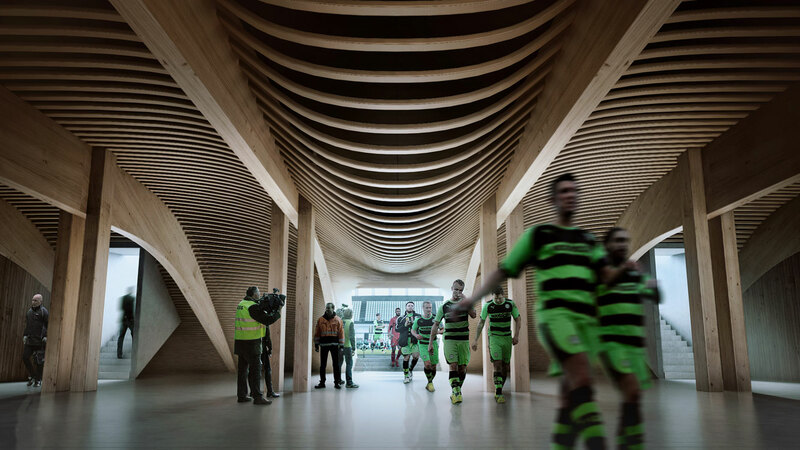 Embodying low carbon construction methods and operational processes, it will be the first all timber football stadium with almost every element made of sustainably sourced timber including its structure, roof cantilevers and louvered cladding. “As a building material, timber is highly durable, recyclable and beautiful. 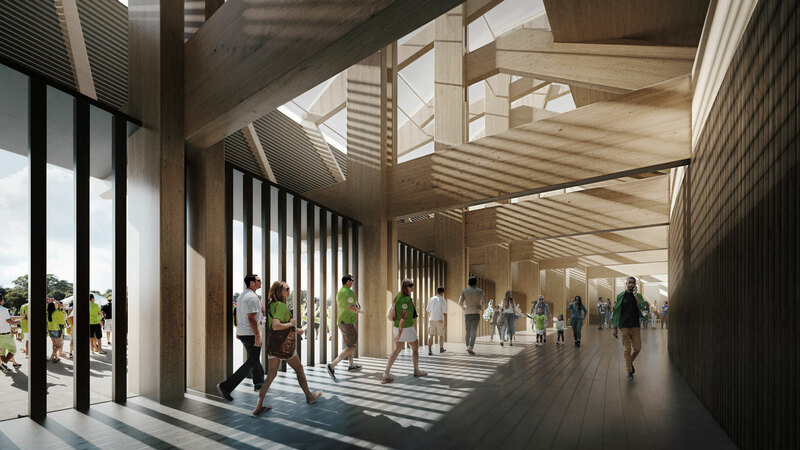 The proximity of the stadium’s structural elements to each other has also been determined to enable the seating terraces and floor slab to be made from timber. In most other stadiums, these elements are concrete or steel. “The stadium’s roof is covered with a transparent membrane, which contributes to turf growth, minimizes stark shadows for players and fans and reduces the volumetric impact of the stadium from distant views in the surrounding landscape. “With the team’s community and supporters at its core, fans will be as close as five meters from the pitch and the position of every seat has been calculated to provide excellent, unrestricted views of the entire field of play. The stadium’s continuous spectator bowl surrounding the pitch will maximise matchday atmosphere. 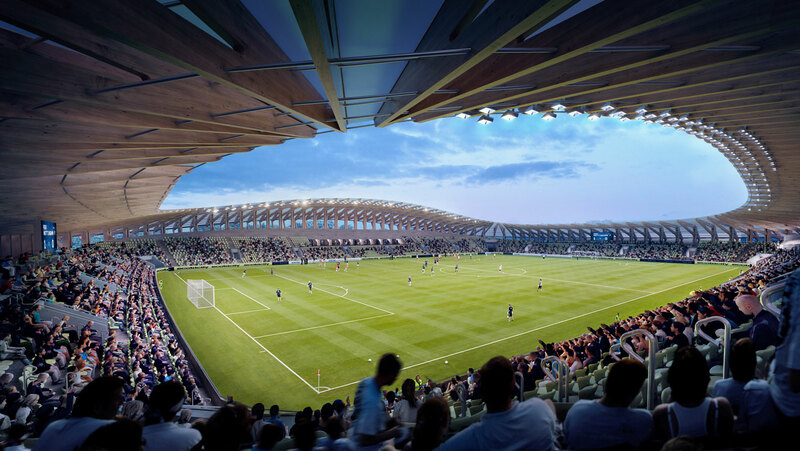 “The stadium’s design incorporates the club’s future growth. Initially for 5,000 spectators, increasing to 10,000 with the club’s success, expansion from phase 1 to phase 2 can be achieved without the costs of major construction works. The runner-up competition entry came from Glen Howells Architects, the firm who designed the award-winning Gloucester Services on the M5.